Aeonium 'Schwartzkopf' produces the most incredible deep burgundy, almost black succulent rosette style leaves that make an eye-catching feature on a sunny windowsill or outdoors on the patio. Producing panicles of pretty little star-shaped yellow flowers in the spring, it bursts to life and the deep coloured leaves set the perfect backdrop to really show the flowers off. This unique plant is stunning as a houseplant, but you can also grow outdoors in a pot in a sunny spot for a unique garden plant. They are extremely drought tolerant and need little care and maintenance, but we would recommend bringing indoors over the winter. Supplied as a pack of 6 plug plants, ready to plant out and will grow to approx. 45-50cm tall once established. 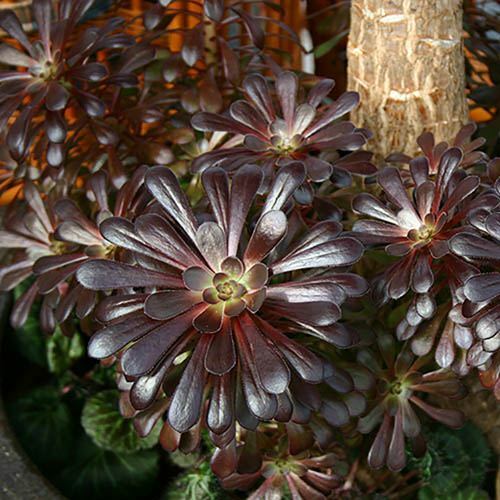 With rosettes of deep burgundy, almost black leaves, growing elegantly on palm-like trunks, Aeonium Schwarzkopf is something different for you. It also produces pretty little yellow flowers in spring! This unique plant is stunning as a houseplant, but you can also grow it in a pot in a sunny spot! They are extremely drought tolerant they dont like being in moist soil, so grow them in pots, in soil mixed with 50% grit and sand. They are not hardy though, so make sure you bring them indoors in winter before the cold weather sets in. Slow growing, they will reach around 40-50cm (16-20) tall in about 3-4 years, and will make a spectacular plant for a windowsill or tabletop. Supplied as a pack of 6 plug plants, ready to plant. Height/Spread: 40-50cm (16-20) Plant: Year-round indoors Flowers: May-June Not frost hardy, so bring indoors in winter.